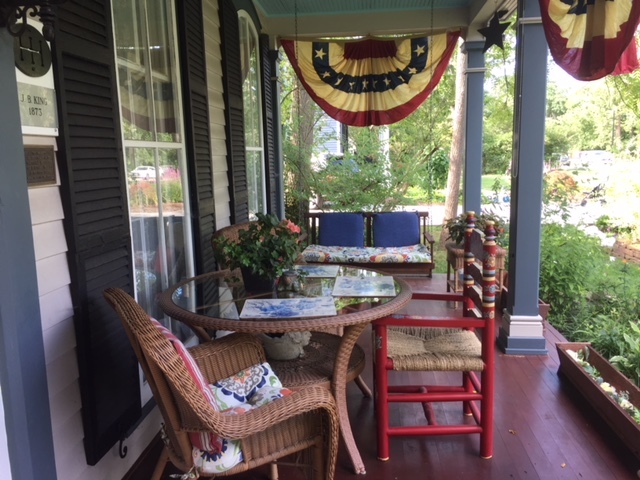 Front porches were commonplace on grand old homes built in the 1800’s. Unfortunately many were removed during the great depression when they fell into disrepair. 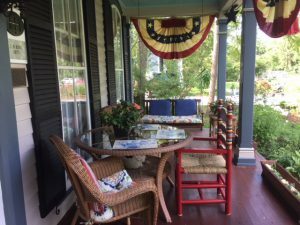 Thanks to historical photographs (now displayed in the front hallway,) the Guest House’s porch has been rebuilt in exacting detail. Plans were painstakingly redrawn from the magnificent photos and work was completed on the cedar and redwood beauty in August of 2006. It features 44 pieces of custom milled trim for each column and solid oak corbels. Comfortable wicker chairs and a cushioned swing now adorn the porch for your comfort. Come sit and take in the Main Street vista of yesteryear.